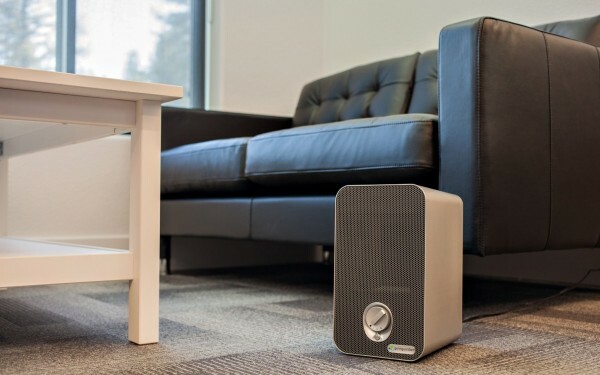 GermGuardian - AC4100: Air Purifier Review • The Air Geeks, reviews of air conditioners, dehumidifiers and air purifiers. If you are looking for a small desktop-type purifier that you can place anywhere or taken with during your next vacation, then let us introduce to this one from GermGuardian Technologies by the name GermGuardian AC4100 3-in-1. As one of the smallest purifiers we have reviewed here, let’s dive straight into the details to see how it performs on the basic features and also see some of its unique features it has to offer. Without wasting time lets head straight to its features. GermGuardian AC4100 3-in-1 is a desktop air purifier, meaning its size is significantly smaller and thus is meant for small areas. The maximum area supported by this purifier is around 80 sq.ft. Most study rooms have a similar space area so it might be ideal there. You must take into consideration while purchasing this item as it may lead to disappointment if the area you need to purify is bigger than that. Its compact and tower-like design is nice to place on your study table as it is sleek and attractive. The design blends well with any setup. Although it uses HEPA filter, it uses a low-grade one that removes 99% of particles as opposed to a True HEPA filter which removes 99.97% of particles as small as 0.3 microns. However, the multi-stage filtering system consisting of a pre-filter, a HEPA filter, and activated carbon is able to do away with most particles present in the air depending on the conditions. In addition to the 3-stage filter system, the air is passed through rays of UV-C light and Titanium-oxide before it’s released back to the atmosphere. This makes sure that all virus and germs present in the air are removed and the air is clean to breathe. While UV light is sometimes not a healthier way to get rid of germs, the maker made sure it is CARB compliant to ensure safety against exposure to large amounts of ozone gas that could be produced by the purifier. Most UV-C purifiers produce similar amounts of UV as CRT TVs so they are similarly as harmless. However, if you have problems with usage if UV light, you have the option to put it off using a switch. The purifier is very straightforward in terms of its usability but that comes with a cost. With just one control knob, that is all you need and it’s good to go! Isn’t that awesome? Well, not to everyone. Most people like having a small user interface like a screen display or something similar so they can set timers and have notifications on the current state of the purifier. Such things are lacking although you can still choose one of the three fan speeds depending on the noise level you can tolerate or the condition of the air. No timers on the control knobs so you’ll have to use another timer to set the running time. This also means the auto-shut feature is lacking which can pose a security issue especially if motors overheat and you are not in the house. This can cause an explosion or start a fire in the house so you have to be very careful when choosing a place for it. Placing it on carpets or on wooden surfaces is absolutely not a good idea. The minimum fan setting produces the lowest noise and can be tolerated by many users as it falls into the category of white noise. One the high settings though, if you are not used to machine sounds especially those with fans, you might feel it as a nuisance in the house but once you get used to it becomes unnoticeable. This is, therefore, a good candidate if you are looking for a purifier that you can place on your computer or bed-side tables. The high-setting has an amazing sucking power and can be effective in removing cat-litter odors and apartment wall-paint smells. GermGuardian AC4100 3-in-1 comes with a one-year limited warranty and support. Recommended Room Size (in sq ft.) -80 sq.ft. 1-Year Limited Warranty: One year is a bit short considering most users are going to have it for much longer time than that. Toxic smell: If it stays on for long time it spews a toxic plastic smell. Great for white noise doesn't bother me at all. And the levels of noise on 2 and 3 are not really loud compared to when I owned a tower air filter. I vape a lot in my room, so I started leaving my device on level 2 instead of 1 and the difference is noticeable. I like not waking up with headaches from allergies from my pets since I got this and put a gate up to my room to keep them out. Edit: if you leave on speed 3 to long; speed 1 sounds like 3 now"
I would like to be able to give this a higher rating than 3 stars because it does work really well for how small it is, however the decibels this thing puts out is terrible. Way too loud to have it sitting in the same room with you. It is louder than my box fan and not nearly as pleasing a sound as a box fan if that makes any sense to you. It's a higher pitch than a box fan I guess. If you needed a very loud white noise machine it could work as that because it will drown out all the other electronic sounds in your house (fridge, freezer, microwave, tv, radio, etc.). It is that loud. On a positive note though, it does pull the air very well and does a good job getting rid of smoke from cigarettes in a small/medium sized room (14x14 // 196 sq. ft.) Going to keep looking for a quieter machine that works well and won't break the bank. 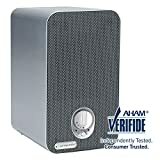 :)"
If you are looking to experiments on purifiers or are new to air purification appliances, GermGuardian AC4100 3-in-1 might be a good place to start. The compact and attractive design gives it a modern sophisticated look and feel which is goes well with contemporary and modern users. They also hits the right spot on the affordability of the purifier which makes it as a good low entry device especially if you are financially constrained or don’t want to spend much money on a purifier. However, a lot of things have to be taken into considerations before buying. The scope of this purifier means it can only be used in small rooms, as small dorm-rooms. Second some users complain on high noise on the maximum setting which needs to he addressed.